The Software Defined Enterprise (SD-Enterprise) is slowly, but surely, becoming a reality. SD technologies are deployed today as silos in different parts of the enterprise, leading to complexity and high costs. This challenge, if properly met, represents an important opportunity for MSSPs to deliver a true secure SD-Enterprise managed service, from the endpoint & IoT, via SD-WAN & the SD-Branch, on to the cloud. 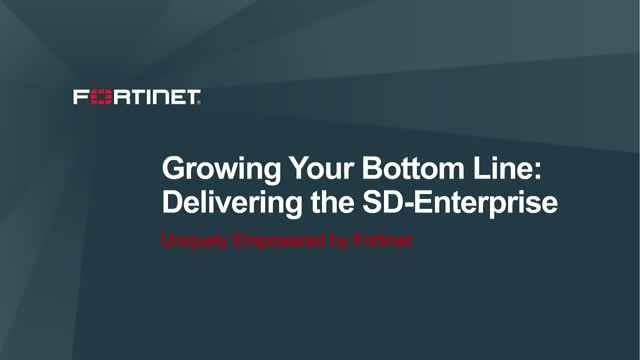 This first in a series of webinars will discuss the Fortinet vision and solutions uniquely empowering MSSPs to deliver on the promise of the SD-Enterprise. Mobile Network Operators, how can you embrace new opportunities with 5G and deliver secure networking capabilities? Find out why security is a critical component for networks and mobile platforms that are evolving from 4G to 5G, and learn how to implement security solutions to maximize visibility and control for IoT devices. Join our Fortinet experts as they discuss practical 5G use cases, and highlight what your organization needs to securely update your infrastructure to benefit from 5G mobility. Join our Fortinet technical experts as they discuss the in-depth why and how intent-based segmentation is vital to your overall network architectur. Plus, real-world use cases including how to seamlessly meet complex compliance requirements such as HIPAA and PCI. NEC and Fortinet have established a technology partnership to help organizations effectively secure their Software Defined Networking based deployments. The NEC-Fortinet joint solution provides programmable cyber defense, automating and enhancing an organization’s ability to protect against sophisticated cyber attacks. Join Fortinet Consulting Systems Engineer Tuukka Helander and NEC SDN experts Franco Buratti and Giuseppe Nantista in this live session which will consist of presentation and a live demo from the NEC showroom in Rome, where FortiGate is detecting indications of compromise and feeds NEC ProgrammableFlow Controller via SDN security adapter to block compromised hosts. In the demo we will show how FortiGate adds Unified Threat Management capabilities to the NEC SDN platform by providing anti-virus, web filtering and IPS functionalities. Going cloud? Trying to figure out how to deliver all that cool IT agility & digital innovation without keeping the CISO up at night? As applications, data and even infrastructure move to the cloud, securing them is top of mind. At least for some of us. So do you simply lift & shift your on-premises security tools to the cloud, along with your apps & data? Is that even necessary? Or do you need something completely new? Join us for a pragmatic look at securing the cloud – what’s different, what isn’t, and how to approach securing this crazy new world of increasingly diverse platforms and dynamic services. SD-WAN was the most sought out technology in 2018. Organizations eagerly adopted it to replace legacy WAN edge products. SD-WAN provides the application visibility to enable digital transformation at enterprise branches. However, many solutions largely lack essential security. - Multiple use cases and examples that demonstrate the cost savings and unified management benefits of SD-WAN. For the past several months social media and the Internet in general has been overloaded with all sorts of dire predictions about the future of the threat landscape. However, if all of these were taken at face value then organizations might as well either close up shop or go back to print advertising and taking orders by paper purchase orders. 3) preventive and predictive technologies are deployed in equal measure. This session will look back on some of 2018’s threat landscape predictions and how close (or far) from the mark they landed. Some of the predictions for 2019 will also be examined to see if any trends have developed year-on-year. Any predictions made during the session will follow the Winston Churchill rule: "I always avoid prophesying beforehand because it is much better to prophesy after the event has already taken place". Join our expert for a look at Fortinet’s unique approach to securing the threat landscape and how the research and analysis or our FortiGuard Labs team pays off to not only allow for an in depth look at threats, but empowers AI to quickly learn and adapt. In this webinar we will discuss some of the key security events and trends over the last year, drawing on threat intelligence facts and statistics as researched and reported by the FortiGuard Labs. As as both cyber criminals and cyber defenders look to new technological advances, we will then consider some emerging threats and defense strategies and discuss how both sides are likely to benefit, and to what extent? In the rapidly changing threat landscape one of the top concerns for most organisations is the introduction of IOT. While some organisations have attempted to prevent the connection of these devices due to their lack or non existence of any security, many organisations and Enterprises have now reached the reality that they are here to stay. With this in mind what risk does this pose to your organisation and how to reduce this risk to an acceptable level? We will walk through some of the options available and how they may help Enterprise manage the changing landscape. In this webinar on demand, John Maddison discusses how Fortinet Enterprise Firewalls deliver a unique fabric-based architecture and why Fortinet was named a Leader in the 2018 Gartner Magic Quadrant for Enterprise Network Firewalls. In a fast growing decentralised and heterogeneous cloud environment, security is often considered an inhibitor to the adoption of public cloud services. In order to become a facilitator for public cloud adoption, security must align itself to native cloud processes, consumption models and mentality. This session will provide an insight into the security technology foundations required to turn security into a public cloud adoption enabler. Security plays a major role in SD-WAN deployments due to the direct internet connectivity inherent to SD-WAN. Any SD-WAN solution and architecture must be considered at both the networking/WAN level AND the security level. This session will focus on the alternative architectures for deploying SD-WAN and security in view of Gartner’s suggested architectures and NSS Labs SD-WAN test report – the 1st independent SD-WAN group test report. DUE TO BRIGHTTALK TECHNICAL PROBLEM EARLIER TODAY, WE WERE NOT ABLE TO SHOW THE PRESENTATION THAT GOES WITH THIS WEBINAR AND HAD THEREFORE HAD TO CANCEL IT. MANY APOLOGIES FOR THIS PROBLEM TOTALLY OUTSIDE OF OUR CONTROL. WE WILL RESCHEDULE AS SOON AS THE BRIGHTTALK ISSUE IS SOLVED. We are a provider of network security appliances and security subscription services for carriers, data centers, enterprises, distributed offices and MSSPs. Because of constant innovation of our custom ASICs, hardware systems, network software, management capabilities and security research, we have a large, rapidly growing and highly satisfied customer base, including the majority of the Fortune Global 100, and we continue to set the pace in the Network Security market. Our market position and solution effectiveness has been widely validated by industry analysts, independent testing labs, business organizations, and the media worldwide. Our broad product line of complementary solutions goes beyond Network Security to help secure the extended enterprise.